Airpup is small for a balloon, because Airpup is a kite balloon. Airpup sips helium and eats high winds. Back Airpup on Crowd Supply. Airpup fits on my bike, and makes less noise. Audio from Airpup is drone-free. Being drone-free also means Airpup can go to parks. 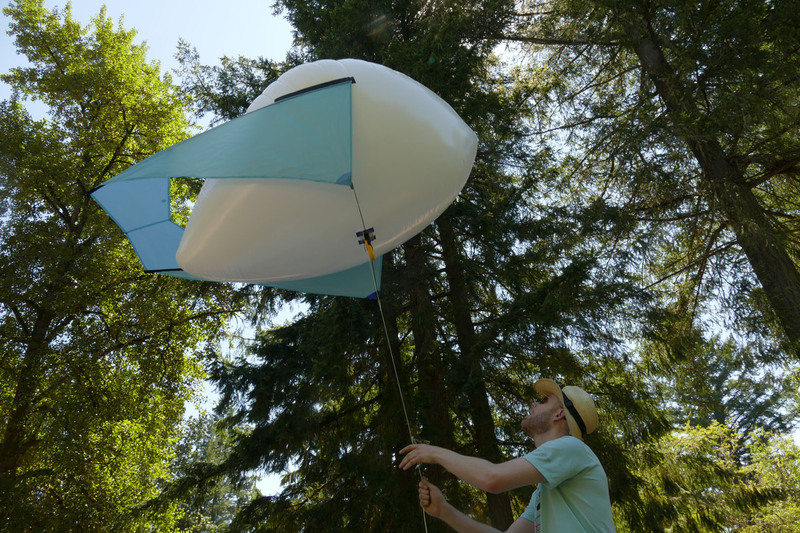 On the helium it takes to fill a dozen party balloons, Airpup lifts 2 oz. Airpup has flown in up to 12-18mph winds. Airpup lifts a 2oz payload with 8cu ft helium / 59g payload with 225L helium. Full-size at 6’ long and 3 1/2’ wide, Airpup will still fit in a hatchback or inside double doors. At 25lbs, a 40 cu ft helium tank can be carted, biked, or carried where needed to fill Airpup and top off pressure. Airpup can accommodate a 1lb payload. The full-size Airpup is getting rigged for lifting right now. My goal is to lift a pound for day, or 1/2 pound for three days on single fill-up. Airpup has 24 oz free lift. You’ll be seeing more about Airpup’s adventures soon, as well as open hardware plans. A special thanks to everyone who helped me design, build, and fly this balloon: Geoff Bland, Charles Willard, Blimpworks, Jayne Meacham, Colleen Donaldson, Beth Donaldson, and all family and friends who’ve supported me.